Clarice Starling: You see a lot, doctor. But are you strong enough to turn that high-powered perception at yourself? What about it? Why don't you - why don't you look at yourself and write down what you see? Maybe you're afraid to. Very few films truly scare me. Most horror films simply cannot scare me at all. Some intrigue me, some engage me, and some exhilarate me, but I can only think of three films that truly scare me. They are, in chronological order, The Exorcist, The Shining, and The Silence Of The Lambs. Something about all three of those films gets under your skin from almost the first shot, and doesn't let go until the credits have finished rolling and the lights come up. But of the three, Silence is the scariest, because it could actually happen. Yes, demonic possession is scary, but in the end, I don't believe in it. But serial killers? Those are real. Combine the already threatening premise with Demme's assured directing, Howard Shore's atmospheric score, and one of the most intense and frightening performances in cinema history by Anthony Hopkins, and you have an all around winner. A killer known only as "Buffalo Bill" (Ted Levine) is on the loose. He abducts women, kills them, and skins sections of their bodies. While this is going on, the head of the Behavioral Science unit of the FBI, Jack Crawford (Scott Glenn), assigns FBI trainee Clarice Starling (Jodie Foster) to question Dr. Hannibal "The Cannibal" Lecter (Anthony Hopkins) for an FBI profile database. Lecter, a brilliant psychiatrist who also happens to be a cannibalistic sociopath, is taken with Starling, and being so starts giving her clues that, she soon learns, relate to Buffalo Bill. Meanwhile, Bill abducts another woman, Catherine Martin (Brooke Smith), daughter of Senator Ruth Martin (Diane Baker). Because Ruth Martin is so important, she pulls out all the stops for getting her daughter back, escalating the need to find the killer. Lecter will only help Starling if she gives him details of her troubled personal history, making Clarice vulnerable at the time when she needs most to be strong. Without a doubt, The Silence of the Lambs is one of the best movies of the 1990s, and is a viable contender for the best horror film or thriller. Adapted from Thomas Harris' fantastic book, screenwriter Ted Tally did an amazing job in adapting it for the screen. While the book gets further into Clarice's psyche and the consequences of various actions taken by several characters, the script does a good job of distilling the most important events and dialogue. While we may not get such an in-depth look into Clarice's mind, what we do have is suggestive enough for the audience to fill in the gaps. The characters of Crawford, Starling, Buffalo Bill, and Lecter are all well written, with believable motives and traits. The only character that seems like a caricature is that of Dr. Chilton (played by Anthony Heald), the head of the asylum in which Lecter resides. Unlike in Manhunter, where Chilton is portrayed as an ethical doctor who wants to help rid the world of a serial killer, in Silence, he is written as a greedy, selfish, sexist chauvinist who only cares about himself. While Jonathan Demme had directed several noteworthy films before this, most notably Something Wild, Stop Making Sense, and Swimming To Cambodia, he was more well known for his lighter fare, such as Married To The Mob. 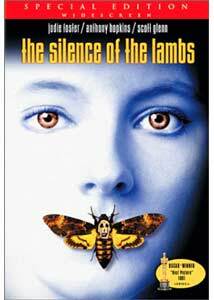 Therefore, The Silence Of The Lambs came as something of a shock to people who knew Demme and his work. It seemed to be too cruel, too dark, and too violent for his sensibilities. However, Demme knew that the heart of the material is not in the violence, but rather in the character of Starling and her relationship to Hannibal Lecter. Thus it is no surprise that the most eloquently shot scenes are those ones where Starling and Lecter interact, but it is surprising just how well the rest of the movie is shot and paced. Demme does not have a problem with showcasing horrific material, but he does leave the very worst of it off screen. It's sad to see that Demme could not equal the work he did here with his later films. Another factor that made the movie so effective is the music. Howard Shore's score should be taught in schools as an example of good movie music. As Jonathan Demme remarked after seeing the movie scored for the first time, you feel the music rather than hear it. The music is subtle, yet not so subtle that it doesn't add to the mood. Its low-key aspect allows it to affect the audience without their realizing it. Someone should really teach this trait to far less subtle composers, such as John Williams or James Newton Howard, who feel compelled to hit the audience over the head with their brash scores that only detract from the movies in which they appear. Of course, no review would be complete without talking about the amazing performances given by just about everyone. Jodie Foster gives an understated performance as Clarice. It's not the kind of role that draws attention to itself, because it's hard to make "quiet determination" to look like anything more than just "quiet," but Foster pulls it off. Scott Glenn is particularly authoritative yet compassionate as Jack Crawford, while Ted Levine turns a role that could easily have been simply clich� into a believable, but not particularly sympathetic character study. The other notable actress of the supporting cast is Diane Baker as Senator Ruth Martin, who is hard-edged and knows how to handle difficult situations, but also is deeply worried about her daughter. Baker grasps all this, and while she only has one significant scene, she plays it so well that her excellence stands out. And then there is Anthony Hopkins. Hopkins' portrayal of Hannibal Lecter has become the most identifiable screen performance since Robert De Niro talked to himself in a mirror in Taxi Driver. And yet, for such an oft imitated, parodied, and referenced performance, it has lost none of its power. From the first moment you see Lecter on the screen, he scares your pants off. Part of the scare is the dialogue, and part is the direction, but most of it is Hopkins' acting chops. This is most evident if you watch Manhunter, because Brian Cox doesn't appear scary at all. While I think Cox is a fine actor in his own right, he just doesn't come off as particularly scary, or even really very creepy. Hopkins can chill you to the bone with a glance, freeze you to your seat with a word, and give you a sleepless night with one bite. If you were to compile a list of the greatest film villains of all time, Lecter would certainly be in the running for the top spot. Image Transfer Review: Despite the fact that the cover says this transfer is "new," the only new thing about it is that it's anamorphic. This is exactly the same as the Criterion transfer, down to where the nicks and scratches show up. Of course, being anamorphic, all the lines of resolution are devoted to the movie itself, which means this disc looks just a tad sharper. But without a widescreen television, you wouldn't know the difference. That being said, the only problem with this transfer (and the Criterion one) is the high amount of dust and spots on the print. For a movie only ten years old, it looks dirtier than it should. But don't get me wrong; this doesn't look bad at all. Colors are nicely balanced, with deep blacks and nice detail all the way through. While I can't complain about this transfer, I just wish it was cleaner. Audio Transfer Review: This new 5.1 mix is absolutely stunning. The depth of field and clarity is so high that it's like seeing the movie for the first time. Suddenly, snippets of incidental dialogue, muttered lines, subtle sound effects and more came out to create a world that the viewer can become immersed in. While all of the action occurs in the front speakers (the rears are delegated to the score), the new mix does such a good job of bringing out sounds that were almost inaudible in the stereo mix that it will make any sound aficionado jump for joy. This new mix really shows just how inventive Demme and his sound guys were with this movie. This may very well be the most expressive sound mix I've ever heard. Extras Review: MGM has not slacked off when it comes to the special features on this disc. The biggest extra is the new documentary, Inside The Labyrinth (also the title of the making-of documentary for the film Labyrinth, coincidentally). This is a lengthy documentary that stands in place of the commentary on the Criterion disc. Now, the commentary on the Criterion disc is one of the best I've heard, and replacing it is no small order. To their credit, MGM rounded up almost everyone who worked on the film in some capacity, with the notable exceptions of Jonathan Demme and Jodie Foster (Foster appears in some TV interview clips from 1991, while Demme only shows up in pictures and behind-the-scenes clips). Since Demme directed the thing, his comments on the Criterion commentary basically say what everyone else here do, only better. Overall, the documentary isn't bad (although it suffers badly from "talking head" syndrome and uses the same photographs and clips over and over), but it's no substitute for the exceptional commentary that the Criterion disc had. This six-minute featurette from 1991 has interviews with Anthony Hopkins, Jonathan Demme, and Jodie Foster. This is simply studio fluff. All they speak to is what the story is about and who their characters are. There have got to be some good interviews with Demme about the movie somewhere, and it would have been nice if they were on this disc. These are an interesting batch of deleted scenes. Most of them are so short that MGM has put all that have to do with a particular scene into one section. A few of these scenes appeared previously, edited back into the scenes they came from, on the Criterion disc (scenes such as the clips from the "Your Self Storage" scene, for example), but a few of them are appearing here for the first time. They're available here in short, digestible clumps, and they're all interesting. This is a short montage of botched lines, missed cues, and one very funny gag by Anthony Hopkins. This reel has the funniest botched line and subsequent response I've ever seen, courtesy of Ms. Jodie Foster. Even though it's very short, it's all funny. This is an extensive and well organized photo gallery. The whole thing is split up into sections. Jodie Foster has twenty pictures, Anthony Hopkins has fifteen, Jonathan Demme has seventeen, Buffalo Bill and Catherine Martin combined have sixteen, there are five portraits, seven FBI-related pictures, eighteen special effects pictures, and twenty behind-the-scenes pictures. The pictures are mixes between movie stills, posed pictures, and behind-the-scenes shots. Anthony Hopkins' Phone Message I don't really know where this extra originated, but it's a silly answering machine message that Hopkins recorded at some point. This isn't really worth a listen; in fact, it's kind of embarrassing to listen to. Trailers/TV Spots First we get the original theatrical trailer, which, I must say, is one of the scariest and most effective trailers I've ever seen. Short, sweet, and to the point. The TV spots are far less effective, although they do vary in quality from interesting to downright awful. Also included is a "Hannibal DVD preview," which is actually the trailer for Hannibal with the disclaimer that it is now available on VHS and DVD before it. Collectible Booklet This is an interesting little packet that gives us some info on the making of the film. Interestingly, there is information here that isn't in the documentary or the Criterion commentary. A nice little bonus. The Silence Of The Lambs is a modern classic. Looking back at it ten years on, it still seems as fresh and timely as it did when it came out. With superb directing, top tier acting, and one of the greatest villains you could ever imagine in the form of Dr. Hannibal Lecter, this is a necessary addition to any film buff's collection, as well as for anyone who just likes to be scared silly. Those who are big fans of the film will want to pick up the Criterion disc for its excellent commentary, as well as some deleted scenes not available here, but will also want this new disc for the anamorphic transfer, amazing new sound mix, and well-thought out extras. More casual fans of the film will do better to stick with this release, since it has the superior sound and anamorphic video.